Couldn’t wait. Had to open my first OFFICIAL Christmas present! That was just the shipper! But it indicated that it contains a HUGE product! The real box looks like this. I love the foil treatment that the box has…it really makes this feel like the premium product that it is. Opening the box reveals all eight decks, in premium foil deck boxes, seated in the proper recesses of a plastic tray designed to hold them. You can also see two official counter dice, one silver and one bluish. Both of these feel a little lighter than the counter dice usually feel…not as much heft. Maybe I’m just imagining that? Then the other issue, is I can’t really read the silver one, my vision being so bad. Still, they are a nice inclusion. 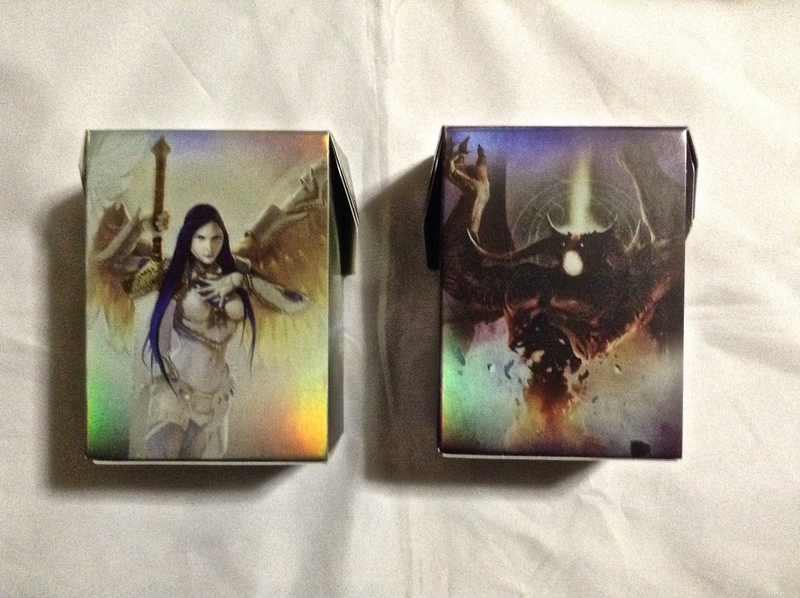 The deck boxes are designed to hold all 60 cards…sleeved. 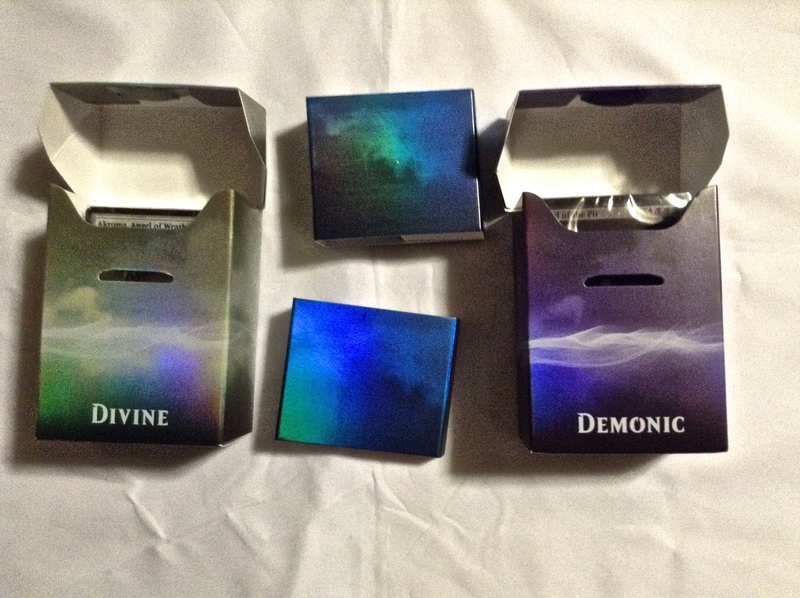 I was afraid that the boxes would be the general boxes that usually come with the dual decks which can only hold the unsleeved cards. So this set my mind at ease at least. The decks have a spacer to help hold the unsleeved cards in place until you can get some sleeves on them. Each deck is cellophane wrapped, of course. You can see “Akroma, Angel of Wrath” and “Lord of the Pit” featured on top of the decks. 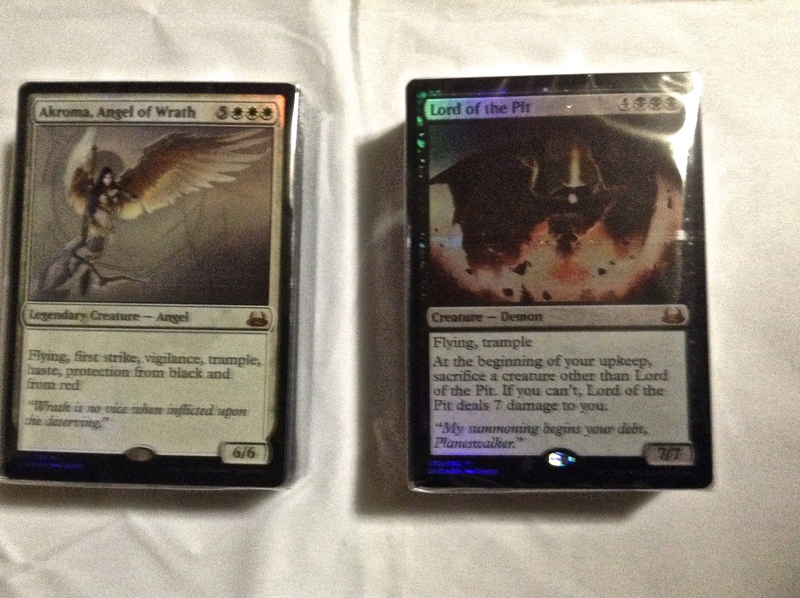 These cards are foil, in the “new card frame,” featuring a holofoil sticker on the bottom of both rares. 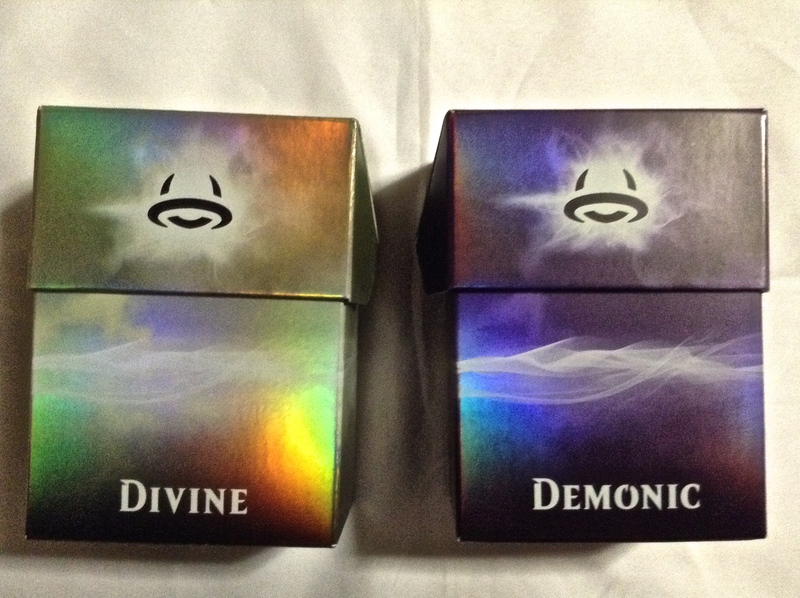 The SpartanKid wielded the Divine deck, and I took on Demonic; those angels were just too much in our initial test. It hadn’t been a good MTG night for me, so thinking that was all it was, I decided to do more testing in the morning…. So what happened? Here is the beauty readers. Keep on reading, and I am going to test each deck against the others, as well as against other decks not in this set. And I will let you know how it turns out, right here at SpartanNerd.com! 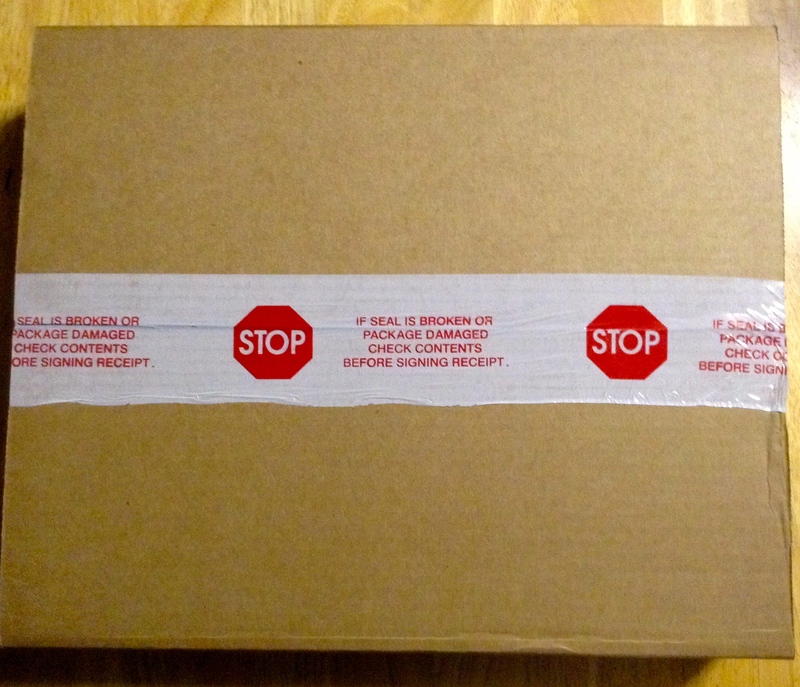 I am only going to grade the experience of receiving the package and unboxing it, as well as other logistical details. I can’t comment much on the contents of the decks yet. The box is huge…as well as beautiful. It is a premium product. The tray inside is very welcome, giving you a way to keep your decks safely shielded from getting bumped around. Two spin-down counters are included. They are nice. I don’t prefer the coloration of the silver one, but that is my personal preference. Other people might like it. Personally I have a hard time seeing the numbers on it. The blue one is just fine, though. The rares are placed in the modern card frame, with a holofoil sticker on the bottom which screams “I’m a Rare!” These rare’s also feature alternate art from the regular circulation. 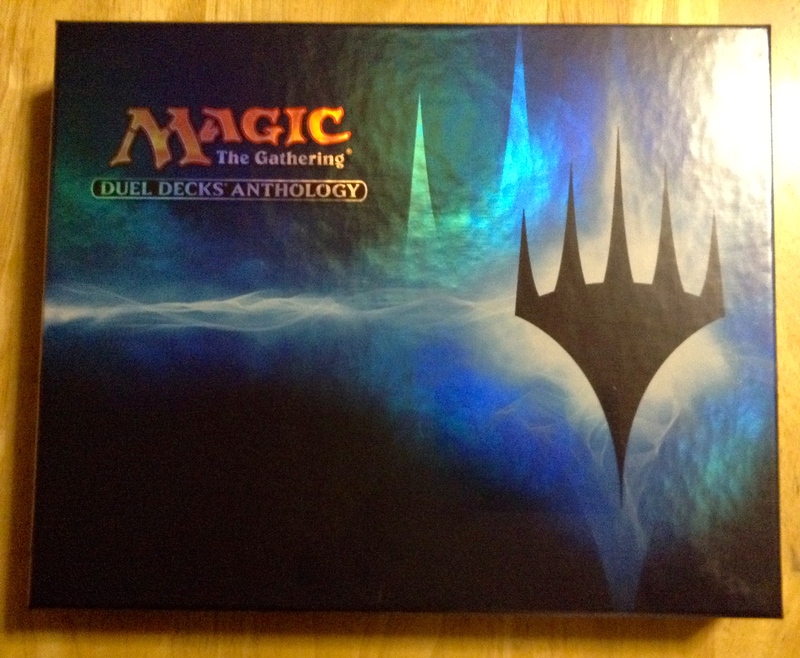 So my rating of the Magic the Gathering Dual Decks Anthology so far is 5 out of 5. I don’t think the weakness of the deck box clasp is enough to take any off. At any rate, if I love the box enough to use it in other places, I can and should put velcro on it, at least. But I suspect the boxes won’t be going anywhere. I have the urge to keep this product in tact, making no changes. Don’t get me wrong…Lilliana is definitely going to see some play in the current Standard environment. And who knows what other card might. But these decks are not going to be modified. The counters are staying put. The boxes. Everything. I am treating it like its own game for the time being. 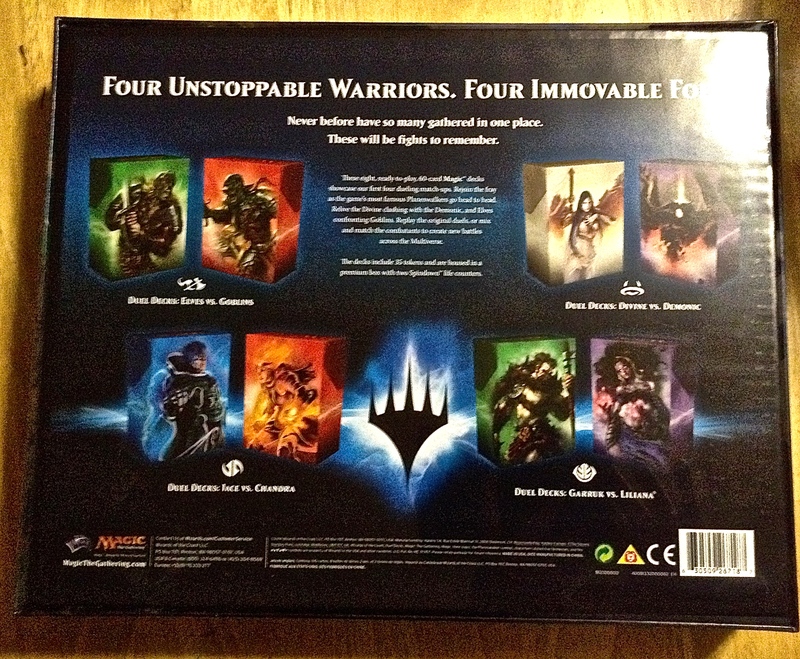 My rating of Magic the Gathering Dual Decks Anthology is 5/5, at least as far as the PRODUCT is concerned. I will be placing more reviews and post information about the different match-ups that happen at my kitchen table as I can! This entry was posted in Lord of the Pit, Magic the Gathering, Magic the Gathering Dual Decks Anthology, review, SpartanNerd and tagged Akroma, Divine vs Demonic, Dual Decks Anthology, Elves vs. Goblins, garruk vs lilliana, jace vs chandra, lord of the pit, Magic the Gathering. Bookmark the permalink. 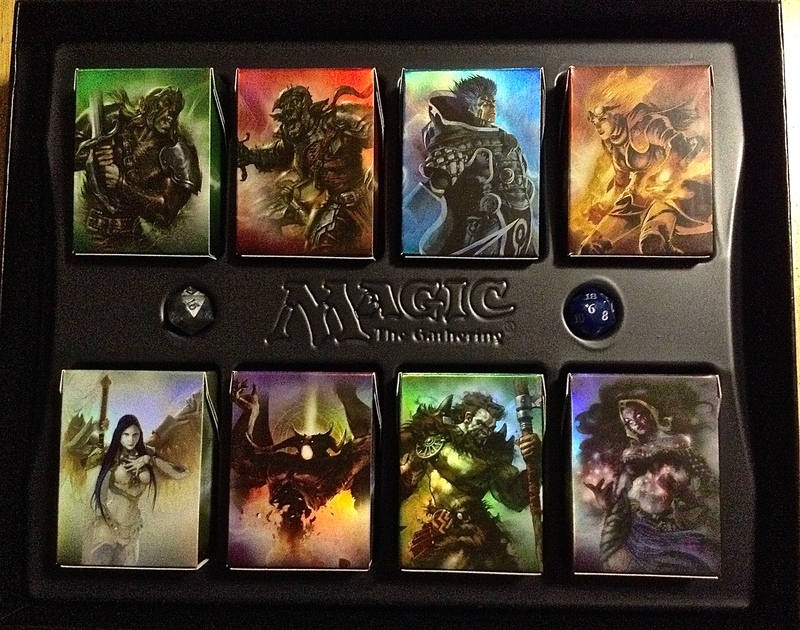 ← SpartanNerd Review Update…Customized Ultra-Pro Pro-Tower Deck Box!